Marysville High School seniors Walker Heard (left) and Madison Powers signed letters of intent to compete in collegiate athletics earlier this week. Heard will wrestle for West Virginia University and Powers will play golf at Mt. Vernon Nazarene University. Although Wednesday was recognized as National Signing Day for high school football players moving on to the collegiate level, Marysville High School saw two seniors sign for other sports. 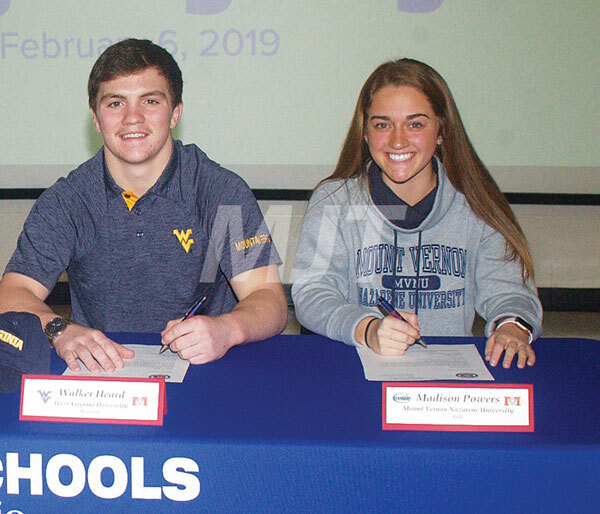 Walker Heard has decided to continue his wrestling career at West Virginia University, while Madison Powers will play on the women’s golf team at Mount Vernon Nazarene University. Heard said he had looked at other schools, including Brown, Kent State, the United States Air Force Academy, Ohio University and Clarion College. He chose West Virginia in part because of its agriculture business program. Heard, who has wrestled in the 152 and 160-pound weight classes this winter, said he will compete at either 149 or 157 pounds on the collegiate level. “I’m comfortable with either weight class,” he said. The Mountaineers have a couple of veterans in those two weight classes. “I’m the only guy who signed in either of those divisions during the current recruiting class,” said Heard, who is a three-time state tournament qualifier and a two-time state placer. Marysville head coach Shawn Andrews was high in his praise for the senior grappler. “Walker has been a pillar of our program, not only for the past four years on the high school level, but also through the youth program and at the middle school,” he said. “He is one of the hardest-working guys in the room and I don’t think he’s ever missed a practice. “He is a hard-nosed, hard-working guy who is committed to wrestling,” said Andrews. “Wrestling at the Division I college level has always been his goal and I feel he’s ready for the next level. Powers’ faith was one of the main reasons why she chose Mount Vernon Nazarene. The Lady Monarch golfer said she plans to study to become a grades 7-12 math teacher, with a minor in youth ministry. Powers said she looked at other schools such as Ohio Christian University, Indiana University-East and Findlay before deciding on Mount Vernon Nazarene. A four-year letter winner for the Lady Monarchs, Powers averaged a score of 46.5 over nine-hole matches during her senior season. She earned the team’s Spirit Award last fall and was previously a district tournament qualifier. Powers said her biggest adjustment to collegiate golf will be the length of matches. High school golfers generally play nine holes per match, with a few 18-hole tournaments sprinkled in for good measure. Powers said her iron shots and her mental outlook are the strongest parts of her game. She did acknowledge that she has to work on her chipping as she progresses with her career.